The recent hostilities between the Gaza Strip and Israel have to be viewed in context of a broader geopolitical chessboard. The events in Gaza are tied to Syria and the US’s regional maneuvers against Iran and its regional alliance system. Syria has been compromised as a conduit for weapons to Gaza, because of its domestic instability. Israel has capitalized on this politically and militarily. Benjamin Netanyahu has not only tried to secure his own election victory in the Knesset through an attack on Gaza, but has used the US-sponsored instability in Syria as an opportunity to try and target the arms stockpiles of the Palestinians. Netanyahu calculated that Gaza will not be able to rearm itself while Syria and its allies are distracted. The bombing of the Yarmouk arms factory in Sudan, which Israel says was owned by the Iranian Revolutionary Guard, was probably part of this plan and a prelude to Israel’s attack on Gaza. In this chess game, sit the so-called “Moderates”— a misleading label jointly utilized by Messrs George W. Bush Jr. and Tony Blair to whitewash their regional cabal of tyrants and backward regimes — alongside the Obama Administration and NATO. These so-called Moderates include the desert dictators of the feudal Gulf Cooperation Council (GCC), Jordan, Mahmoud Abbas, and Turkey. In 2011, the ranks of the Moderates were augmented by the NATO-installed government of Libya and the GCC/NATO-supported anti-government militias that were unleashed in Syria. On the other side of the chessboard defiantly sits the Resistance Bloc composed of Iran, Syria, Hezbollah (and Hezbollah’s partners in Lebanon, like Amal and the Free Patriotic Movement), the so-called Palestinian Rejectionists, and increasingly Iraq. The Muslim Brotherhood, which has emerged as a new regional force, is being increasingly prodded into the Moderate camp by the US and the GCC in an attempt to ultimately play the sectarian card against the Resistance Bloc. Israel’s attack on Gaza was a litmus test. All those voices continuously pushing for America’s McJihad against the Syrian government in the name of freedom vanished from their podiums or suddenly went silent when Israel attacked Gaza. Al Jazeera’s tele-preacher Yusuf Al-Qaradawi and Saudi Arabia’s dictator-selected Grand Mufti Abdul Aziz went silent. Adnan Al-Arour — the Saudi-based exiled kooky Syrian cleric who, as one of the spiritual heads of the Syrian anti-government forces, has threatened to punish anyone that says that Al-Qaeda is among their ranks — even berated Hamas and the Palestinians for fighting Israel. The fighting in Gaza really placed them in a fix. Here we see the contradictions in their “Arab Spring.” We now see who really pays lip service to Palestinian liberation and who does not. Moreover, the foreign supporters of the Syrian National Coalition, a rehash of the Syrian National Council, are ironically all supporters of Israel. The Iranian Fijr-5 symbolically embodies Tehran’s support for Palestine. Despite the fact that Israel and Gaza are by far not equal, it was predominately Iranian arms and technology that changed the balance of power. Tehran has been the main ally and supporter of the Palestinian resistance. The US, Israel, Hezbollah, Hamas, the Palestinian Islamic Jihad, and Iran itself have all acknowledged this in different ways. The Palestinian Islamic Jihad, which is unapologetically pro-Iranian, has openly stated that everything Gaza used in the fight against Israel, from its bullets to missiles, has been generously provided by Tehran. It was even reported during the fighting that Hezbollah, using a special unit dedicated to arming the Palestinians, resupplied the Gaza Strip with some of its own long-range missiles. This has all taken place while the cads in Saudi Arabia, Qatar, and Turkey have instead armed the Syrian anti-government militias. Egypt and Jordan continue to be major partners in preventing Iranian arms from reaching the Palestinians. Palestinian fighters have also been trained in Lebanon, Syria, and Iran. Ironically, the anti-government forces in Syria are also targeting members of the Palestinian Liberation Army in Syria. The support that the Resistance Bloc has given the Palestinians puts those actors, like Turkey and Qatar, opposed to the Syrian government in a real predicament. These so-called Sunni states were embarrassed; not only did they fail to help a predominately Sunni population, but their insincerity was exposed. This is why there is an active effort to deny the support that Iran and its allies have provided for Gaza. As a back story to all this, the Israeli attack on Gaza and the Moderate’s wooing of Hamas is more than just about neutralizing Gaza. Hamas leaders are being tempted to choose between the Moderate and Resistance camps and increasingly between governing or active resistance to the Israeli occupation. Through this, some form of accommodation to the US and Israel is being sought from Hamas. The aims are to de-link the Palestinians, particularly Hamas, from the Resistance Bloc in order to portray Iran and its allies as a Shiite alliance bent on dominating the Sunnis. If you are foolish enough to fall prey to it, welcome to the unfolding “American fitna” (schism) that aims to ignite a regional Muslim civil war between the Shiites and Sunnis. The Obama administration is trying to construct and line up a Sunni axis against the region’s Shiite Muslims. It is a classic strategy of divide and conquer that envisions America and Israel dominating the region as the Muslims are incapacitated by their bloodletting. The Shia are systematically being vilified courtesy of the new media war: Iran, Hezbollah, Bashar Al-Assad (an Alawi who is increasingly labeled a Shiite for the benefit of this project), and Nouri Maliki’s administration in Iraq are being portrayed as the new oppressors of the Sunnis. In their place Turkey, with its virtually stillborn neo-Ottomanism foreign policy, and Egypt under the Muslim Brotherhood are being presented as the champions of the Sunnis. Never mind that Egypt’s Mohamed Morsi has continued the blockade of Gaza for Israel or that Turkey’s Erdogan lost his voice for a while when Israel began bombing Gaza. The US is trying to use Egypt’s Muslim Brotherhood to control Hamas, because it was Cairo that established a ceasefire between Israel and Gaza. While Iran offers military technology, logistical support, and finance the Egyptians are being presented as Gaza’s ticket to establishing some form of normality and the GCC as alternative funding. This is why Qatar’s Emir Al-Thani visited Gaza to tempt Hamas with his declining supply of petro-dollars. Inside Hamas there are internal differences over this. While Damascus, Tehran, and Hezbollah desired some form of public acknowledgment about their vital assistance to Hamas and the Palestinians, Hamas officials were careful about their statements. When Khaled Meshaal thanked Egypt, Qatar, and Tunisia during an important press conference, he narrowly mentioned Iran. Meshaal’s politicking was not lost on Hezbollah Secretary-General Hassan Nasrallah, who responded hours later by rhetorically asking who supplied and painstakingly transferred the Fajr-5 missiles into Gaza? Nasrallah asked people to look past Gaza’s fair-weather friends, like the Qataris and Saudis who think they can buy their ways into the grace of the Palestinians, but to look at Gaza’s tested friends who allowed Gaza to stand on its own two feet. Then the Lebanese leader reaffirmed the ongoing support of the Resistance Bloc for the Palestinian people. Despite its politburo’s position on Syria, Hamas is still a part of the Resistance Bloc. There is a new format now. If Greece and Turkey were at odds with one another as two NATO allies, then Hamas can have its differences with Syria and still be allied with the Resistance Bloc against Israel. The divide in the Middle East is not a sectarian one between Shiites and Sunnis, but fundamentally political. 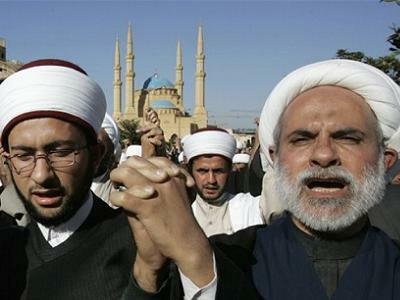 The alliance of the predominately Sunni Muslim Palestinian resistance movements and the Free Patriotic Movement, Lebanon’s largest Christian political party, with predominately Shiite Muslim Iran and Hezbollah should defuse such a perception that the US and its allies are trying to cultivate. Mahdi Darius Nazemroaya is a sociologist and research associate at the Centre for Research on Globalization (CRG) in Montréal and the author of The Globalization of NATO (Clarity Press). 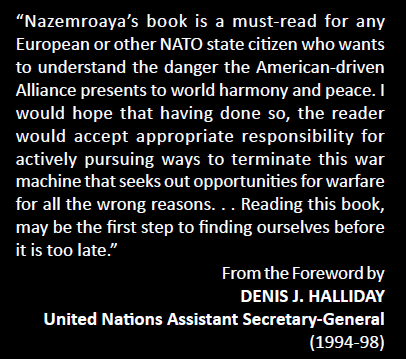 Read The Globalization of NATO (Clarity Press) by Mahdi Darius Nazemroaya to learn more about the attempts to divide the Middle East among Shiite and Sunnis Muslims.